At first glance, the idea of a watch designed specifically for hunting might seem a bit excessive to some. In theory just about any watch should be suitable for use while hunting. In practice, however, this isn't quite the case. Watches designed for hunting are outfitted with numerous features that many hunters may already find themselves carrying other specialized tools for such as a GPS or a compass. By consolidating these tools into a watch you reduce your load and the complexity of your setup. First up in our hunting watch roundup is the Timex Expedition. This watch comes in either olive drab or black and is designed with a resin band and housing for the watch itself. Intended as a very affordable option it lacks some of the higher end features such as GPS but still retains all the necessities. The Timex Expedition is likely the simplest watch on our list and has a simple layout on the face with the date on the top and the time beneath that on a digital readout. The numbers on the face are illuminated by Timex's Indiglo backlight giving them a very readable, but not blinding, level of illumination in the dark. The watch shock resistant as well as water resistant to depths of up to 200 meters or about 660 feet. Finally, the single button operation makes switching between the clock, digital compass, and stopwatch features of the watch a breeze. As mentioned this watch has positioned itself as by far the most affordable watch for hunting. This is ideal if you just want a watch to throw around and beat up while you're in the field. That being said, it is an impressively resilient watch with its resin body and substantial water resistance. It may feel lacking in features to those more accustomed to high-end GPS equipped watches, but for those seeking something more on the simple side, this is a fantastic option. 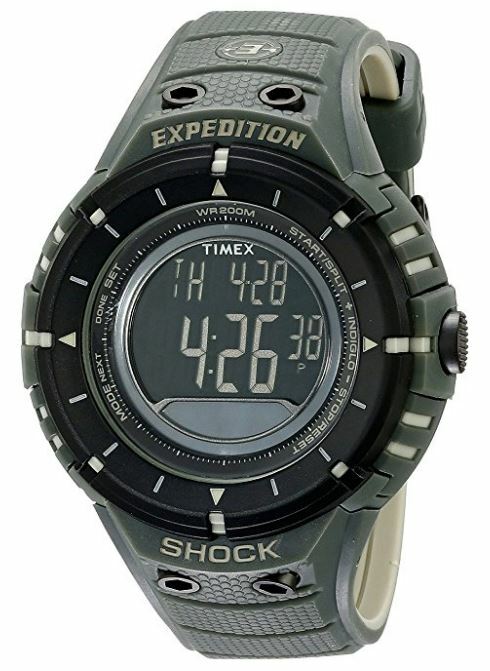 This model from Timex sports a paltry assortment of tools onboard, boiling down to simple stopwatches and a digital compass. While a compass is an indispensable tool while in the wilderness hiking or hunting, without a map this feature is useless, meaning you're still forced to carry some extra equipment on your outings. 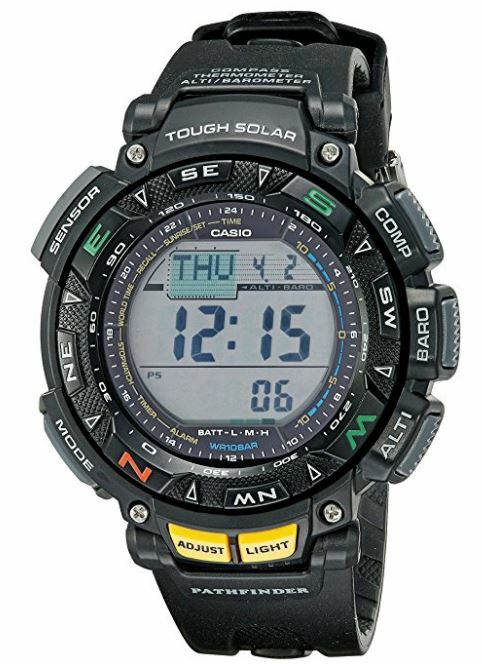 Next up we're looking at the Casio Pathfinder, a reliable solar watch with up to 6 months of battery life without seeing the sun. The Casio Pathfinder features many tools that our previous offering was lacking, while only representing a slight rise in price. This watch is constructed of stainless steel with a mineral face and a black resin band. Inside the case of the watch are an array of sensors that allow the device to not only display a digital compass, but also an altimeter, barometer, and a thermometer. The watch also boasts presets for 48 cities in 31 time zones as well as an automatic calendar that is good to go without any changes until 2099. While not quite as water resistant as the Timex Expedition, the Pathfinder can still handle depths of 100 meter or over 300 feet. In addition, the watch is ideal for cold weather and is resistant to temperatures as low as 14 degrees Fahrenheit. For the price, this watch is packed with Features. While not all of the things you could possibly need are included, things like the altimeter and barometer can give you a lot of information with just a little knowledge. With minimal research you can learn to make accurate forecasts with the barometer, allowing you to see rain coming well before anyone else. This watch is gigantic on most people with the case coming in at 51mm, which is the largest in our roundup. On some people, this may not be too much of a hindrance, while to others this can certainly get in the way of vital hunting activities that require dexterity. 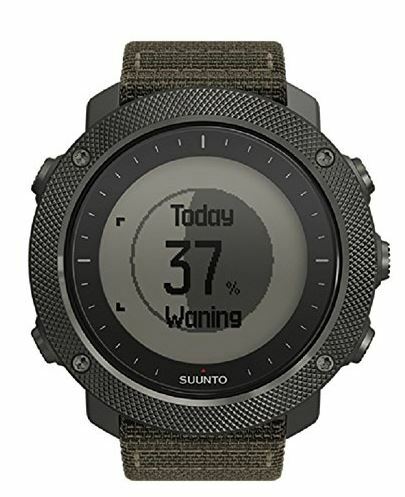 Moving onwards and upwards in our roundup we arrive at a watch that has some truly incredible features, the Suunto Traverse Alpha. This watch not only looks sleek with its knurled stainless steel case and olive drab nylon strap but also sports very impressive functionality. The Suunto Traverse Alpha is the first watch we encounter on our list that has built-in GPS functionality. This allows the watch to keep track of where you've been and lead you back to where you came from in the incident you get lost or just feel like finding the quickest way back. The watch can also be synced up with the Suunto phone app that is available on both iOS and Android. The watch actually records not only your movements but when and where you fire your rifle or shotgun, allowing you to go back and look at information regarding exactly where an animal was spotted or bagged. The face of the watch is designed from an incredibly durable sapphire crystal and has a very sleek and simplistic design. The five buttons around the perimeter of the case allow the user to cycle through tons of features such as a digital compass, time and date information, automatically GPS updated moon phases, or even a map of their path. This is the first watch on our list that has GPS features, and while this does add an incredible array of functionality to the watch, it also strains the battery in a way watches without GPS tracking don't suffer from. The huge power draw means that this watch actually needs to be recharged rather often. It has a 2 week battery life when only being used as a watch, but if you frequently use some of the other features this will be much less. 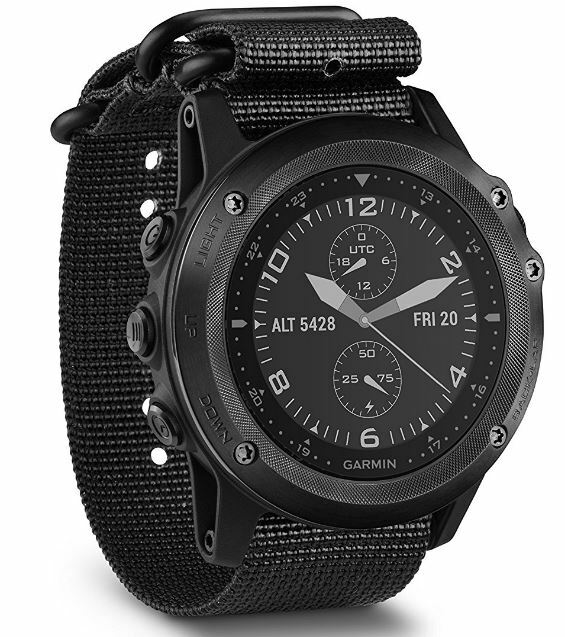 The Garmin Tactix Bravo is, as the name may imply, probably the stealthiest watch in the roundup. It features an all black non-reflective finish that makes it very difficult for any animal to spot while you're tracking or posted in a tree stand. The Garmin Tactix Bravo is equipped with both GPS functionality and a wide array of internal sensors that can measure a variety of atmospheric conditions such as temperature, barometric pressure, and altitude. All of this information is displayed on the 1.2-inch high-resolution chroma screen which is protected by a sapphire crystal. The watch not only keeps track of position data but can also display incoming messages or emails coming into your phone. The tough sapphire crystal is exceedingly scratch resistant which pairs well with the watch's durable case that is water resistant down to 100 meters in depth. The watch also uses an omnidirectional EXO antenna, meaning even when in valleys or other difficult terrain the device is still very likely to be able to pick up a GPS signal. The feature-laden nature of the Garmin Tactix makes it necessary for the watch to have a complex software running the show behind the scenes. The menus are well designed and easy to navigate but the watch will sometimes actually crash and either freeze or stop working. When this happens a restart will get things working properly again, but a standard watch will never have this issue. The last watch on our list is the Garmin Fenix 5 Sapphire. This watch is a full featured activity tracker in addition to being a great GPS position tracker. The watch has sensors on the back of the case that lie against the user's skin to measure things like heart rate and oxygen saturation in the blood. As the most high-end watch in this roundup you would be correct in assuming the Fenix 5 is packed with cutting edge features. In addition to similar GPS functionality as the last two watches on the list, this one also include barometric and temperature sensors, as well as laser sensors on the back of the stainless steel case that read vital signs from the wearer. The watch can display a huge amount of information rangning from altitude, to lattitude and longitude, to the user's blood oxygen saturation, which can be good to known when hunting at high altitudes. The watch can be synced to the Garmin app on your phone to collect and record all of the information this device takes in. On top of gathering an incredible amount of information this watch retains the necesary level of durability for use while out in the brush hunting. The stainless steel case is water resistant down to 100 meters and the sapphire crystal is also impressively durable and not likely to scratch from normal use. 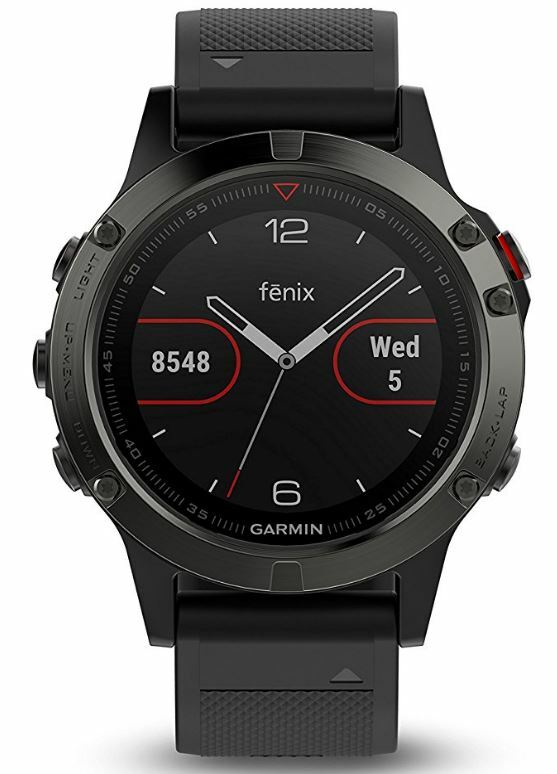 As with the previous Garmin watch on this list, the Fenix struggles with being too complex, and the software required to run such an intricate device will almost always have some faults. The watch is known to crash, many users reporting multiple crashes a month. While the restart time is very short, the watch will lose about 4 hours of recorded data when it does happen to crash. When selecting what kind of watch to use for hunting there are a variety of factors to take into consideration. If you're skeptical of how much use a watch for hunting may actually be, then read on and consider how your current watch stacks up in some of these categories. Thinking about these factors will also help you determine which of the watches on our list will be best for your purposes. Naturally watches will vary in durability and some are made to take abuse in ways that others can't. A complex swiss timepiece could very well shatter into a million pieces if dropped. The watches on this list are all shock resistant to varying degrees, with the case being constructed of either tough stainless steel or a shock absorbent resin. Additionally, the material that the crystal is made of will have a big impact on how easily scratched the watch is, with sapphire offering the toughest scratch resistance. Finally, waterproofing should be considered depending on what kinds of conditions you are planning to take the watch into. All of the watches in this roundup are water resistant to at least 100 meters in depth, which is around 300 feet, with the especially tough ones like the Timex Expedition being able to go down to about 200 meters, or 660 feet. Being able to get and maintain your bearings while in the woods out hunting is incredibly important, which is why all the watches on this list have built-in digital compasses. While a compass may be enough to navigate you to safety, sometimes even more information is required for purposes of tracking where an animal was spotted or bagged. In this case three of the five watches on this list have built-in GPS receivers that can get detailed data on your coordinates. Being able to accurately record latitude and longitude can come in handy when trying to find traps or tree stands that you many hunters leave out for weeks or even an entire season. Most of the watches in our roundup also feature an array of sensors that can detect altitude, barometric pressure, and temperature. These may not seem very useful at first glance but with a little research, it is actually surprisingly easy to learn how to use this information to forecast changes in the weather. This can be super useful when out in the field and the weather looks like it might be taking a sudden turn for the worse. Checking the changes in barometric pressure over time can give you insight into oncoming rain well before the forecast can update online or on the news. Regardless of what kind of climate or environment you go hunting in the additional features sported by the watches on this list makes any one of them a great choice for just about any outdoor activity. Beyond just telling time these watches can give valuable information about the weather and even your location. This kind of tool can come in handy in a wide variety of situations and could potentially even be a lifesaver if you ever lose your bearings or get lost in the brush. Whether your seasoned veteran or just getting into hunting, a good hunting watch is a must.